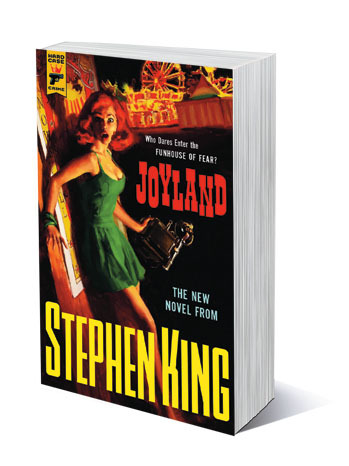 Fruitless Pursuits: Book Review: Stephen King's "Joyland"
First, it should be known that I have very limited context with King as a writer. I read On Writing earlier this year, and outside of being familiar with the film/television versions of a lot of his work, I had never actually read any of his fiction. My mother, when I was growing up, was a huge Stephen King fan, and I still have memories of her reading It and having to slam the book shut and put it down because she was so scared. More recently for me, I've gotten into more horror and "weird" fiction, the latter of which is not a space I generally place King, but the former being almost entirely due to Joe Hill, King's son. So my appetite for expanding my genres has been somewhat successful. 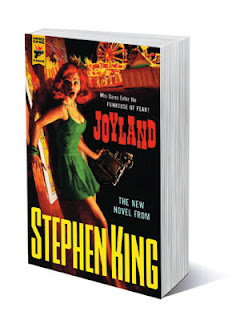 Joyland does have its horror/creepy moments, but it is not so much a horror book as much as a summery murder mystery. Taking place in a North Carolina carnival in the early 1970s, it follows a college student, Devon, who takes up a job with the carnies for the summer. He learns the carnival way, befriends a lot of the characters and families at the fair, and also learns of a grisly murder that occurred at the carnival in the past. Devon, along with his new girlfriend and a disabled boy he befriends along the way, get to the bottom of the murder as well as continue to grow up and grow old. One surprising thing for me, at least, was how much the murder/mystery/horror took a backseat to the broader story of a kid, to use the cliche that's been put out there to describe the book, "coming of age." The ending in particular is very suspenseful and well crafted, but the book really shines less as a murder mystery (you barely hear about it until well over 100 pages have passed) and more as a period piece in a mostly forgotten era. The plot and setting are both extremely credible, and King even says in the endnotes that he did some research into making sure the correct lingo and slang was used with the carny folk. I could even relate to the main character - in a few scenes, Dev talks about having to dress up in a mascot costume, and how punishingly hot it was. I did the same thing at an old bookstore job, and it nailed the feeling perfectly. More to the point, at under 300 pages, it doesn't have a lot of room to meander, and that just helps the plot that much more. Especially in these attempts to try and revisit old tropes, the good often comes part and parcel with the bad, and King avoids that quite well. I have a lot of good to say, but it's not 100% positive. That the book sells a murder mystery but isn't one is period-appropriate, but not really what anyone would expect or is looking for today. And while the book is written in 2012 and is presumably narrated around the same time, some weird modern nods (such as one reference to Hogwarts from Harry Potter) end up feeling out of place. I can also imagine a reader looking for classic scary King and getting something different. For a reader like myself with little to go on, I didn't mind at all. If my mother were able to pick this up and read it, though? Anyway, a really great read, and one I'm glad I was given the opportunity to pick it up and give it a look. The book is coming out exclusively in paperback (no eBook planned!) tomorrow in the United States, and later this week in the rest of the world, along with a limited edition hardcover version in a week or so. You can check it out at Titan here, and you can check out a bunch of other Joyland goodies at the Titan Books blog. Great story-as far as I am concerned nobody writes characters like Mr. King does-fast read and very engaging-buy this book and take it to the beach perfect summer book.